The deceleration was broad-based, with the manufacturing segment posting a 1.2% MoM contraction while mining and utilities dropped 7.8% and 5.4%, respectively, compared to December. This was in line with the recent Economic Sentiment Indicator (ESI), which showed that industry confidence - the most important component - eased further from its highest levels post-GFC reached in December, due to sharply lower expected production and increasing inventories though order book levels saw some improvement. Manufacturing, the most important component of the IP data, still accelerated on a three-month rolling basis from 3.1% to 3.4% while the 12-month figure increased from 9.2% to 9.7%. 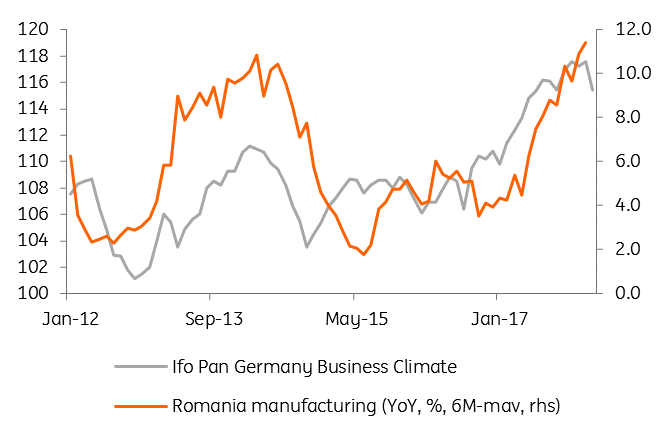 However, with Eurozone industrial production shifting into a lower gear in February, a weaker PMI and Germany’s Ifo dropping to its lowest since September 2017, it is likely that the domestic manufacturing segment will track external demand and slow down further over the next period. That is unless the government delivers on its promises of spending c.4.2% of GDP on investments in 2018, which will be a significant task since last year’s investment spending barely hit 2.3% of GDP – the lowest on record. Either way, today’s industrial figures are still solid and supportive for our 2018 GDP growth forecast of 4.7%, which is still above Bloomberg's consensus of 4.2% but significantly lower than the official forecast of 6.1% or the forecast assumption for the state budget of 5.5%.